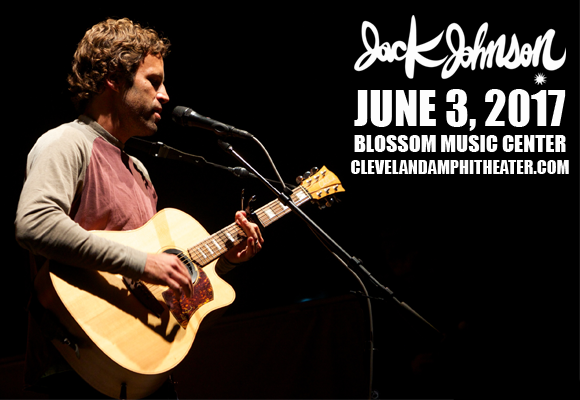 Multi-platinum selling artist Jack Johnson comes to Blossom Music Center on Saturday 3rd June 2017 for a night of easy, breezy summer vibes and mellow folk songs! The beachside singer will be releasing a new album this year, and is touring on an extensive run for the first time since 2014, so expect an exciting show from the "Sitting, Waiting, Wishing" star! Jack Johnson is an American singer, songwriter, musician, actor, record producer, documentary film maker and a former professional surfer. Johnson first came to public attention when he was featured on the song “Rodeo Clowns” on the G-Love album Philadelphonic. This lead to recording his debut album Brushfire Fairytales, which was released to widespread acclaim in 2001. Since then, Johnson has reached number on on the Billboard 200 chart with four of his albums (Sing-A-Longs and Lullabies for the Film Curious George in 2006, Sleep Through the Static in 2008, To the Sea in 2010, and From Here to Now to You in 2013), also reaching the number two spot twice with In Between Dreams in 2005 and again in 2013. Johnson's next album is slated for release in summer 2017.